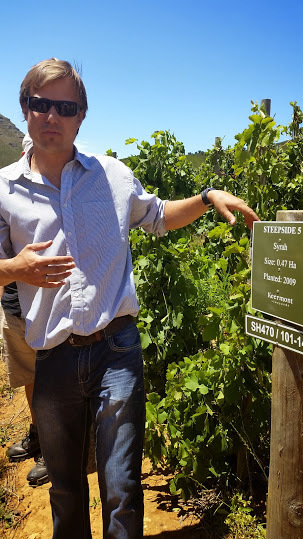 Total plantings on Keermont situated in the Blaauwklippen Valley below De Trafford and above Dornier and Waterford amount to 30ha. Until now, there have been just four wines (a white blend, a Syrah, a Bordeaux-style red and a vine-dried sweet) but now a single vineyard series has been launched, the idea being to highlight specific sites that provide the very best grapes, these wines made only in years where the principal range is not compromised. From a vineyards planted in 1971. Fermented and matured for 12 months in old French oak. A complex nose showing lemon and yellow peach, a honeysuckle top note, some nuttiness, spice and a little yeasty complexity. On the palate, the wine shows the depth of fruit which old vines so often seem to deliver. Rich and broad before a savoury finish. Not as vibrant and giving as the white blend Terrasse but perhaps more intellectually rewarding. Alc 13.5%, RS 3g/l, TA 5.4g/l and pH 3.45. Total production: 572 bottles. From a north-facing vineyard planted on clay soils on the Helderberg side of the farm. Matured for 20 months in second-fill French oak. Ripe red fruit plus a little earthy character and dried herbs on the nose. Not so much round and plush as dense with fine, mouth-coating tannins. Abv 14%, RS 1g/l, TA 5.2g/l, pH 3.74. Total production: 867 bottles. From a west-facing vineyard planted on rocky sandstone-and-granite soils. Matured for 20 months in second-fill French oak. Red and blue fruit, fynbos and lavender. Great flavour intensity but appears not quite so full bodied as the Steepside. Good freshness and nicely grippy tannins. Moves really well in the mouth. Abv 14.5%, RS 1.8g/l, TA 5.6g/l, pH 3.52. Total production: 667 bottles.